Bde Maka Ska/Mahpiya Wicasta Public Art & Site Improvements	Two projects acknowledge historical presence of Dakota at the Chain of Lakes. 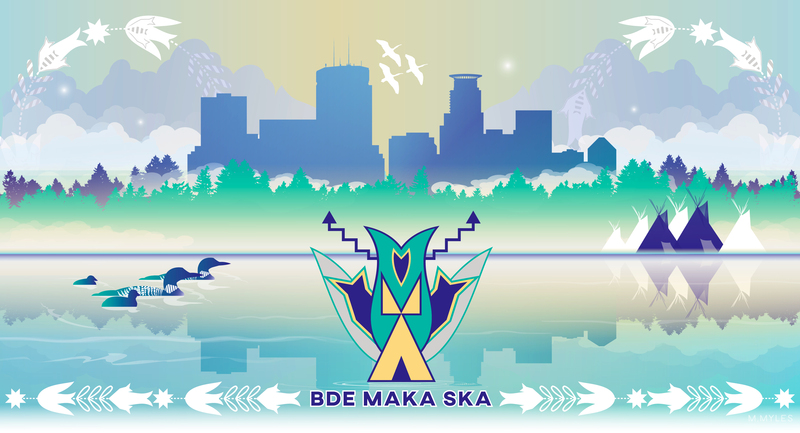 Staff presented a study report [PDF] update on the Bde Maka Ska Public Art Project at the August 9, 2017 meeting of the Board of Commissioners. The Study Report includes an updated site design, concepts for some of the public art elements, and a timeline. Note: The public art process has a different project timeline. See $225,000 public art project. Enter your email to receive updates about meetings, events and more. The MPRB wishes to encourage participation by everyone to our programs, activities and services. If you feel you need an accommodation in order to fully participate because of a disability or language interpretation need, please call Planning at (612) 230-6472 (or the Minnesota Relay System at 711) or e-mail planning@minneapolisparks.org in advance of the meeting so arrangements can be made prior to the meeting. There are currently no meetings scheduled. Check back or enter your email address above to subscribe and get notified of new meetings. Archeological evidence shows that Native Americans inhabited the region around the Chain of Lakes for thousands of years, perhaps since the most recent glaciers receded around 12,000 years ago. Humans were probably drawn to the beauty and natural resources of the area, especially the lakes, the largest of which was known to the Dakota people as Bde Maka Ska, or Lake White Earth, referring to its white sand beaches. The lakes received water from large wetlands and lakes to the north before emptying into Minnehaha Creek and ultimately the Mississippi River. The lakes were rich in wild rice, shellfish, waterfowl, and fish. The surrounding oak savannah and prairie uplands provided abundant game. The Dakota consider the confluence of the Mississippi and Minnesota rivers to be the birthplace of their people and sacred. The Dakota have inhabited the lands and waterways of a region which included the Chain of Lakes for centuries. They lived in villages, hunted and fished, and grew crops on small plots; sharing their harvests with their neighbors so that no one starved. The Ojibwe, who expanded into the area west of the Great Lakes in the 1600s, lived to the north in the forests. They would enter Dakota lands to hunt and trade. Sporadic conflicts between the Ojibwe and Dakota occurred up until the 1830’s. For several decades prior to 1800, European explorers and traders interacted with the indigenous Dakota. In the Treaty of 1805, negotiated by Zebulon Pike, two of seven Dakota leaders agreed to sell, “for an unspecified amount of money,” land at the confluence of the Mississippi and Minnesota Rivers, a place sacred to the Dakota because they believe it to be the origin of their people. The Dakota were never paid the value of the land and the Treaty was never ratified. In 1820 the U.S. military established its presence in the area with the construction of Fort Snelling and extended its influence to the Chain of Lakes. The church also arrived and built several missions, seeking to convert native people to Christianity. As whites explored the area and began to settle, Bde Maka Ska became known as Lake Calhoun, named after John C. Calhoun, Secretary of War until 1825 under President James Monroe, and Bde Uman (the Other Lake) became Lake Harriet, after a military commander’s wife. As more whites settled in the area, game became scarce. Over the harsh winter of 1828-1829 many Dakota starved. Mahpiya Wicasta (Cloud Man) decided to give white man’s farming a try. He moved his band to the uplands on the east side of Bde Maka Ska, naming the settlement Heyata Otunwe or the Village to the Side. With plows provided by Lawrence Taliaferro, the Indian agent at Fort Snelling, Cloud Man’s band successfully grew crops for a decade. An 1835 map by Taliaferro from Fort Snelling shows Cloud Man Village as extending slightly north of present day W 34th Street, south into current Lakewood Cemetery, and east past Fremont. In 1834 Gideon Pond and his brother, both missionaries, arrived at Bde Maka Ska with the purpose of converting the Dakota to Christianity, teaching them farming, and assimilating them into white culture. The Pond brothers renamed Heyata Otunwe, Village to the Side, “Eatonville”. They built a cabin in 1834 at the edge of the high bank on the east side of Bde Maka Ska where St Mary’s Greek Orthodox Church now stands. The Pond brothers wrote the first dictionary of the Dakota language in order to translate the Bible and speed conversion. The Pond Brothers are commemorated today by a bronze plaque on a boulder along the lake located below the site of their cabin. In 1839, Mahpiya Wicasta’sband of Dakota left their village at Bde Maka Ska because the site was vulnerable to attack by the Ojibwe. The band moved to what is now Bloomington. Following the Dakota War of 1862, Dakota were rounded up and imprisoned. Approximately seventeen hundred elderly individuals, women, and children were interned in a concentration camp at Fort Snelling over the winter of 1862-63. Many, including Mahpiya Wicasta, died. The following spring, survivors were loaded onto a steamboat and sent to Crow Creek in South Dakota. The effects of the forced expulsion of the Dakota people from Minnesota after 1862 and subsequent historical trauma of the unacknowledged genocide are still deeply felt today. Dakota visiting the Chain of Lakes area have expressed that they do not feel welcome because there is little recognition or expression of their history. The only acknowledgment within the Chain of Lakes Regional Park today of Native American history or of the Dakota inhabitation of the area is a small plaque on a boulder on the south side of Bde Maka Ska near a cedar tree. The very name Lake Calhoun is particularly onerous to Native Americans because John C. Calhoun, as Secretary of War, drafted the treaties that removed indigenous peoples from their homelands and set up the Bureau of Indian Affairs as part of the War Department. Other minority communities that have experienced oppression and discrimination by Euro-Americans also object to the name of Lake Calhoun, because John C. Calhoun was a slave owner. In 2012 the MPRB Board of Commissioners passed a resolution to allow a memorial to Chief Cloud Man in the William Berry park area. The memorial was to include a tree, a rock, and a plaque, and would be funded by neighborhood contributions. When the selected site flooded in 2014 and with the master plan for Calhoun/Bde Maka Ska-Harriet on the horizon, the memorial planning group decided to include memorial plans as part of the scope of the master plan. In September of 2015, in response to advocacy from community members, the MPRB Board of Commissioners passed a resolution to add Bde Maka Ska to all the park monument signs identifying Lake Calhoun. Although members of the Native American community thought this was a “nice gesture,” they continue to advocate for the restoration of the name Bde Maka Ska and elimination of the name Calhoun from the lake and park. A majority (15-4) of the Community Advisory Committee, led by its Equity Subcommittee, supported a resolution to restore the name (see Equity). In early 2016 MPRB sought and received funding of $225,000 from Public Art Minneapolis to interpret Native American history and culture in the park and to memorialize Mahpiya Wicasta. The engagement with the community began in the fall of 2016 and will be integrated with construction improvements in the southeast corner of Bde Maka Ska.